Social media marketing is an inseparable part of modern business, due to the fact that no marketing strategy can be complete without it. To fully understand this, you need to recognize the connection between social media marketing and other types of online marketing. These two types of marketing are closely linked as they complement each other. Content marketing refers to creating content that is supposed to attract and engage the audience. Content can be presented in various formats, such as blog articles, presentations, videos, e-books, etc. The main goal of content marketing is to get website visitors interested in your company, by offering something for free, regardless if it is tutorial, hangout, etc. In order to succeed in this approach, content has to be of high-quality, original and helpful. After you create the content as a part of content marketing, you will need a medium to promote that content, so this is where you reach out to social media marketing. One of the best ways to promote your content is through your social media channels. Obviously, the benefits of such promotion will depend on the popularity of your social accounts. Besides sharing content yourself, you should encourage your website’s visitors to share your content on their own social media accounts, which helps you with increasing the viral potential of the content. Social sharing buttons are usually used inside the content, such as the buttons at the top of the article, as a way to enable users to easily share the content they find interesting and helpful. The potential number of times the content is going to be shared is closely linked to the quality of the content, which is why we have stressed out the importance of developing and publishing high-quality content. Content marketing greatly relies on the usage of social media for promotion, but social media marketing also counts on content marketing for providing content that is to be shared on regular basis in order to keep a social account active. Since being active and sharing quality content is an important part of social media marketing, using content developed as a part of content marketing strategy is crucial for having something to publish on your social media accounts. You can always share content from other blogs and websites, in order to keep the level of diversity and ensure that your followers are getting the most useful content you can find and recommend, but it is also important to share your own content, as this is the only way to get traffic to your blog or website, where you will get the chance to convert the visitors into clients. Email marketing refers to establishing communication with prospective clients or advertisers via emails. The process of reaching people online is conducted through various email campaigns, where you can try to achieve numerous goals, such as trying to sell, announcing a discount in your store, asking for other websites to link to your website, etc. In each of these cases, regardless if you are trying to reach individuals or companies, you will need email addresses to establish this kind of communication. There are different strategies that are used in email marketing that will enable you to get emails of the people you want to contact, and one of them is through the usage of social media. In this case, these two types of online marketing collide and social media marketing becomes a tool to be used in the process of collecting email addresses and generating a list of prospective clients. The approach used in social media marketing for this purpose involves using online promotions hosted by an online application. There are numerous online applications that can be used in the purpose of hosting a promotion. The idea behind this approach is the following. You announce a promotion where you will be awarding your social followers with a certain discount or gift, and in return, the participants will have to fill in the form where they would provide their email address. This way, the users will be encouraged to provide this kind of information, as they would like to obtain the prize. From your part, you will be getting emails in a completely legitimate way, along with the users’ permission to contact them via the email address they have provided. Search engine marketing refers to the process of search engine optimization (or organic reach) and to the paid advertising (or paid reach). Both of these types of marketing help you with website positioning and reaching customers when they are conducting a search using a specific search engine. Choosing either of these two options has its own benefits and disadvantages. While the organic reach requires much more time in optimizing and positioning, paid reach requires no such time to be invested, but it does require a budget in order to afford paid campaign. Organic positioning might be easier for popular brands and those with several years being present online. On the other hand, paid reach enables anyone to get positioned, without much effort. In addition, paid advertising ensures you get the top position in the search result, while there is no such guarantee with organic reach. Social media primarily affects organic reach, as the latest updates of the search engine algorithm have included social networks in the search results. This way you try to look something up using a search engine and you will most definitely see the social networks results related to the search on the first page of the search results. Obviously, popularity of the account, as well as a description, activity and influence of the social account will affect these results. 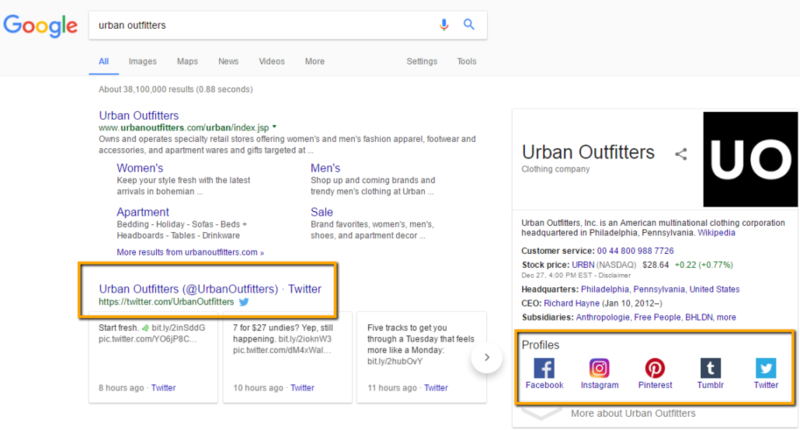 For example, if you look up a famous clothing brand in Google, you will see that the official website is shown as the first result, but it is immediately followed by accounts on social networks, which include Instagram, Twitter, Facebook and Pinterest.